Time to show off a few more things that I am currently living without in my life but I wish I didn't have to XD It's always fun to gush over dresses and other online and geeky wares that you and your friends are currently lusting over. Let me know if you also wish you had any of these items listed below and we'll gush together! 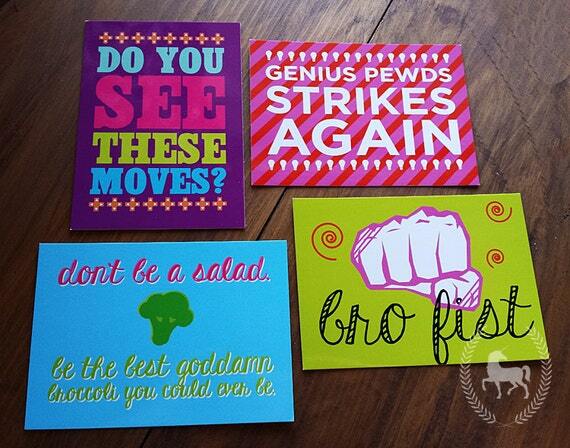 #1: PewDiePie-themed Note Cards from Wordtoyourunicorn! The only thing better then these note cards inspired by a lovable YouTuber and gamer is being able to send these note cards to somebody who is also a fan of the lovable YouTuber and gamer! Of course the Etsy shop, run by Overlord Leslie, is taking a bit of a break, so I shall have to be patient and wait to get some PewDiePie cards - and some TMNT cards - and some GoT cards - and Studio Ghibli cards. Basically all of the note cards from Wordtoyourunicorn are amazing. #2: Anatomical Heart Necklace from Boutique Academia! Now that I'm on such a big Frankenstein M.D kick, out of all the awesome jewelry pieces to select from on Boutique Academia, I'd have the say that the one I'm yearning for the most would have to be this one! I also had my eye on another necklace that had Latin written on it that translated to "She who dares, wins" which is pretty amazing.I'm thinking that if I need a gift for any of my friends in the Computer Science department at my university, this would be the place to pick them up. #3: The Lizzie Bennet Diaries DVD Set from DFTBA Records! If I'd had the money at the time of the Kickstarter for this DVD boxset, I definitely would've ordered it and waited in agony with the rest of the LBD fans for mine to arrive, just like Katie Campshure who made this video about waiting for her DVDs (which has disappeared from YouTube for some reason :( [Side node: I think Katie Campshure is amazing and I wish she was my friend XD]). But now the box set is available on the DFTBA site again, and I'll either order it when I have the spare cash or I'll ask for it for Christmas. My aunt is a huge Jane Austen fan and I really want her to watch this adaptation to see what she thinks. #4: The Sequel to Now You See Me! I have been a huge, HUGE fan of this movie ever since it came out. I was excited to see it when I saw the trailers, and I'm pretty sure I saw it in theaters three times in total (including one round at the drive-in). I adore the characters and the story line and the plot twists and I am super anxious for the sequel to be made. Unlike a lot of movies that are out nowadays, like the infamous superhero flicks or films based off book series such as Divergent and The Hunger Games, this isn't meant to be a full-franchised series, but merely a story told in two parts, hence the second movie. I am very eager to see what will happen next in the magical universe of Now You See Me. Is there anybody out there that loves this movie as much as I do? #5: Royal Bones Black Corset Dress from Hot Topic! Truth be told, I almost bought this dress when there was a big sale on Hot Topic and when international shipping was super cheap. This dress is a it shorter and a little more bold than what I would typically wear, but I still feel like I could totally rock it with the right attitude ;) I'm probably going to wait until the option to ship orders to the new Hot Topic store in NOTL becomes a reality, then I'll start ordering this store's amazing and geeky wares. What top items are on your wish lists right now? Let me know in the comments below!